A California home grower uses his fingers to pick off any undesirable leaves from a cannabis plant. 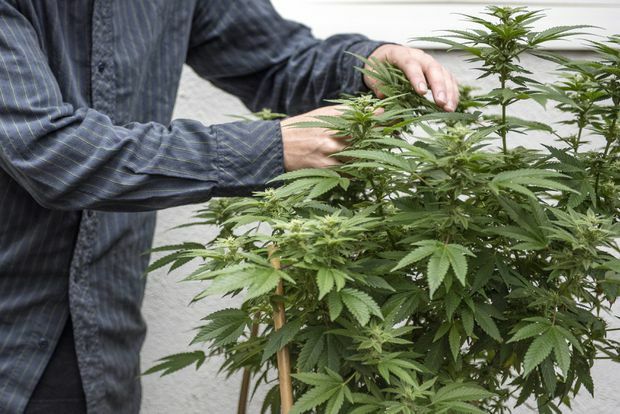 The national organization representing home appraisers is warning that growing cannabis at home will soon be legal, but it still comes with a risk. The new law legalizing cannabis includes allowing Canadians to grow a maximum of four plants in their homes. Keith Lancastle, chief executive of the Appraisal Institute of Canada (AIC), is calling on the federal government to help educate homeowners on what he calls the dangers of growing at home. Realtors, insurers, rental property owners and even some provinces have sounded off on the risks of growing cannabis in a residential homes. Some have pressed for outright bans on the practice. Alberta’s Boardwalk Communities, one of the province’s largest corporate landlords, recently banned not just growing but also smoking and even eating cannabis products in its apartments. The provinces of Manitoba and Quebec have included in their cannabis legislation provincial offences that would fine anyone who attempts to grow at home. The federal Minister of Justice, Jody Wilson-Raybould, has said the Liberal government would not take those provinces to court over their home-growing regulations, but said she couldn’t do anything about a private citizen choosing to contest those laws. In Ontario, the cannabis bill introduced by the Progressive Conservative government focused on privatizing cannabis retailers, but it left aside the issue of home growing. “Our point of view is, let’s hit the pause button on legalizing grow-at-home operations until we have some foundational elements in place,” said Tim Hudak, president of the Ontario Real Estate Association and a former leader of the Ontario PC Party. Under Mr. Hudak, OREA has been lobbying hard to urge different levels of government to slow down the expansion of home cultivation until things such as home-inspector retraining and municipal registries for illegal grow operations can be increased. He was unable to persuade the federal government to block tenants or owners in multiresidential buildings from home cultivation, but he hopes the Ontario government will join Manitoba and Quebec in an outright ban. “There’s still a lack of clarity around how mortgages and insurance are going to work if you choose to grow marijuana in your home,” Mr. Hudak said. “And you can bet your bottom dollar that one of the first questions home buyers are going to ask, going forward, is if marijuana was grown in the home." Mr. Hudak also pointed to polling data from Nanos Research, which in a September, 2017, survey of 500 Ontarians found 60 per cent of respondents were “concerned” with the potential for property damage related to home-grown cannabis. Mr. Lancastle says appraisers will have to tread a fine line in dealing with homes where cannabis is in cultivation. Appraisers are barred from sharing personal information about a homeowner discovered during a home inspection. One analogue for the kinds of personal or sensitive conditions appraisers would be able to report on might be a room with stripper poles or other acrobatic equipment.